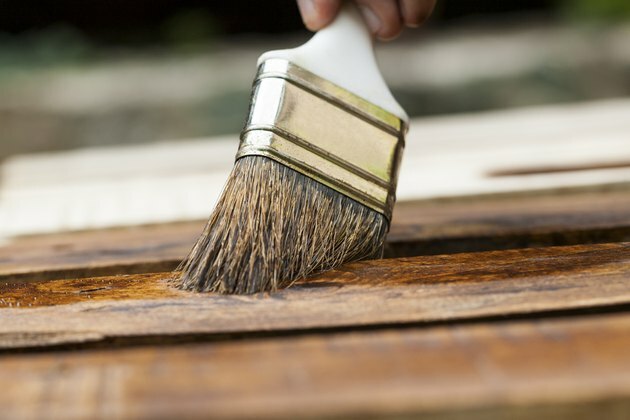 The best staining brushes are expensive, and they get better with age if you know how to take care of them. One of the cardinal rules of brush care is to clean it thoroughly after each use. That's easy to remember when you're painting, but because stains are thin, you can be tempted to let the cleaning slide, especially if you plan to use the brush again tomorrow. That's a mistake because oil- and water-based stains can clog bristles just as finishes do. Cleaning fresh stain is easy, but reconditioning a brush with hardened stain may take a little time. A well-maintained stain brush can last for years. Scrape off as much of the stain as you can into the can. Run the bristles back and forth across a scrap piece of wood or cardboard to get more off, then rub the bristles on a rag. Pour the appropriate solvent -- mineral spirits or turpentine for oil-based stain and warm, soapy water for water-based stain -- into a bowl. Immerse the brush and shake it back and forth for a minute or two. Turn it upside down to allow the solvent to penetrate into the cluster of bristles near the handle, then immerse it again and shake some more. Discard the solvent. If you're using mineral spirits or turpentine, pour it into a separate container; you should be able to reuse it after the stain settles out. Pour clean solvent into the bowl and give the brush a second treatment, shaking it and inverting it. Use a wire brush to comb the bristles to get all the pigment out. Dry the bristles with a rag, then take the brush over to the sink and squirt some dish soap on the bristles. Work the soap through the bristles with the wire brush, then turn on the hot water and hold the brush under it to rinse out the soap. Keep combing the bristles with the wire brush while the brush is under the water. Dry the brush again with a rag, then wrap a paper bag around the bristles and let the brush sit flat on the workbench overnight. Hang it on a hook in the morning. Pour strong solvent into a jar. If the hardened stain is oil-based, you can use lacquer thinner, but for oil- and water-based stains alike, a commercial brush cleaner is a better option. Suspend the brush in the jar -- using a piece of wire to hold it so the bristles don't touch the bottom -- and let it sit overnight. Comb the brush with a wire brush to remove sludgy deposits from the bristles and to soften them. Work the wire brush into the dense region near the handle. Slosh the brush around in the solvent some more. Pour mineral spirits or warm soapy water into a bowl -- depending on the type of stain -- soak the brush and comb it with the wire brush.